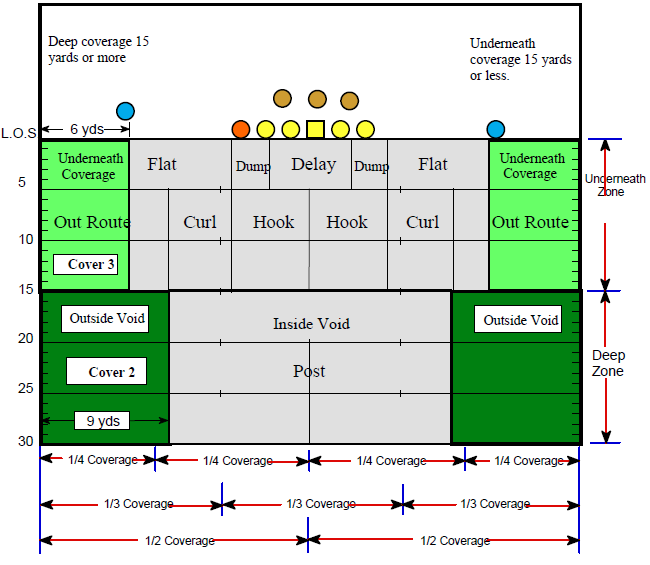 The following secondary information has been shared with me by the many coaches I have worked with over the years.The diagram above breaks the field down into zone areas. Each area of the field is broken down into areas of responsibility. You will always have two areas of responsibilty for your coverages, an underneath coverage which extends fifteen yards deep from the line of scrimmage and deep coverage that takes you fifteen yards or deeper. When playing underneath coverage a defender needs not get any closer to the sideline than 6 yards, this becomes his landmark for breaking down on a receiver in his area and that area is termed the Flat area of responsibility. When in any type of deep coverage the secondary defender needs not get any closer than 9 yards to the sideline, this becomes his landmark. The reason for 6 yards in underneath coverage is because it is considered that area when the ball is thrown the defender can still react to the break on the ball. The depth of 9 yards on deep coverage is different because the ball is in the air longer thus giving the deep defender longer to recover and break on the ball. The stance of our defensive backs will vary depending on the type of coverage called (man or zone). In general, our defensive backs will stand in a two point ready position at a point of alignment defined by the type of coverage called. Our defensive backs stance should be with knees dropped and knees flexed and weight over the forward foot or knee. The feet should be narrower than the width of the shoulders, approximately 12 inches. Weight should be placed on the balls of the feet, never on the heels. The feet should be positioned to a toe-instep stagger. Whether they are balanced or staggered our defensive backs should always push off the front foot as he begins to backpedal or shuffle. Anchor the outside foot at the alignment point and drop the inside foot with hips and shoulders square to the L.O.S. or slightly facing inward. Focus the eyes to the total picture of keys with vision on the quarterback, receivers, and backfield. The anchor point is determined by ability and assignment. It may be outside eye, outside shoulder, or 1 to 2 yards outside of the wide receiver. The depth depends on the coverage called and the ability of our defensive backs. As an Example, a cover 2 Corner may align two, four, five or seven yards off of a receiver, or on the L.O.S. on a press look. A man corner likewise will align at a depth he feels comfortable with. Our defensive backs may disguise their coverage by alignment or stem to their alignment timing their movement with the quarterback’s cadence. Our defensive backs may show press coverage and the bail to the actual coverage called. The strategy of the game becomes apart of the alignment bluff, keep this in mind when determining our drills. Whenever aligned inside of a receiver anchor the inside foot at a point and drop the outside foot slightly. The anchor point will be determined by the coverage and ability of the defensive back. One reason for the inside alignments is to establish leverage on the receiver. Inside alignment is used in man coverage or into boundary with restricted horizontal yardage. Outside leverage is generally used in zone coverage or man with inside bracket responsibility. 1. If a recveiver is aligned 6 yards or closer to the boundry, always align on the inside. 2. If a receiver aligns wide anticipate an inside release, the receiver is making room for his inside route or look for a run play in that direction. 3. If a receiver align’s tight, look for the outside release, key the receiver’s splits.